Can Gemini woman Aquarius man be together mentally, emotionally and sexually? 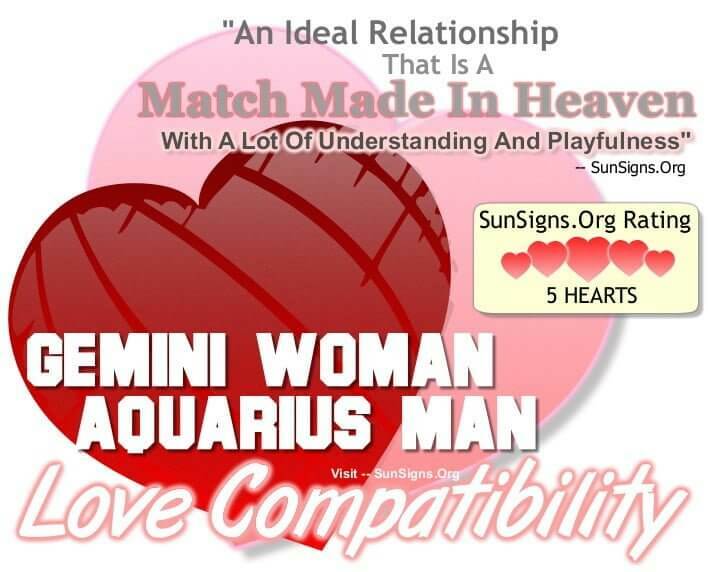 The Gemini woman Aquarius man relationship is an ideal one. Both of them understand what the other wants. But are they willing to do more than that. The Gemini woman enjoys her independence, and the Aquarius man requires freedom to roam, making them an understanding pair. Her creativity matches his quirky nature, and they always have plenty to talk about. The Gemini woman and Aquarius man compatibility is a match made in heaven with wonderful understanding. Find out now if Are Gemini woman and Aquarius man a good match? The female twin is fun, flirty and vivacious, all attractive qualities to the male water bearer. He enjoys the game of life and wants to extract as much out of it as possible. The Twin seeks out new adventures, making the Gemini woman Aquarius man soulmates a great pair for touring. He’s out to conquer the world, and he has an equal force of nature by his side. The Aquarius male energy rivals her own, both physically and mentally. Both the Gemini woman and Aquarius man couple experience their sexual encounters in their head, and she offers him the mind games he loves to play. What is the best sign for a Gemini woman to marry? If the Gemini woman and Aquarius man in love can get past her occasional moodiness and focus on their deep mental and spiritual connection, the relationship will go far. This is true for the Gemini woman Aquarius man in bed as well. Their playful banter brings the union to the next level, and they are both up for anything that is sexually stimulating. Which zodiac sign is the best in bed? The Gemini woman is quite inventive between the sheets, and he responds in kind. He’s not afraid to experiment, and she is the partner who will try new things. Spontaneity is what will keep both of them coming back for more. This is what makes this Gemini compatibility spicy. Read more about Gemini woman sexual traits and Aquarius man sexual traits. Even when the Gemini woman is dating the Aquarius man, she can’t be bothered to hold a grudge for that long, because she wants to spend her time on more important matters. Luckily, her Aquarius mate can be forgiving if she puts up a fair fight. And then they can return to the harmonious aspects of their life together. Overall they share excellent love compatibility in mind, body, and soul. For although he can be more determined than his counterpart in this Aquarius compatibility, he will always want her by his side. For once he decides who is worthy of his love of affection, and that is not an easy decision, he wants to know he was right. And the Gemini female in love will reaffirm that for his time and time again. The only time this Gemini woman Aquarius man friendship runs into trouble is when her mood swings get in the way of their travel plans. She needs someone as fluid as her when she changes her mind, and he can be more stubborn in his decision-making. He also has no patience for emotional outbursts, as he does his best to hide his feelings. The only potential snag in the Gemini woman Aquarius man compatibility is that both these sun signs can be flighty in their way, which means it may take some time for the relationship to gel. But once it does, they will be loyal to each other and love in the deepest way possible. Now, this isn’t to say there won’t be arguments between these similar zodiac signs, as their heated debates could turn into nasty fights. Aquarius men in love tend to be more steadfast by nature, especially when they are barreling full speed ahead toward a particular goal. If you are dating an Aquarius man, he’s ready to change the world, while she simply wants to experience all it has to offer. Gemini women have a carefree nature, and their offhand remarks may cut a bit too deep for their Aquarius partner, especially when she brings out the razor tongue. And he doesn’t back down easily from a fight, which may result in her losing interest. This can eventually lead to a breakup of the Gemini woman and Aquarius man marriage. Gemini is a mutable air sign whereas Aquarius is a fixed air sign, the Gemini woman Aquarius man compatibility gets a FIVE Hearts rating. They satisfy both the physical and mental aspects of their desires, making their shared life a fulfilling one. This is a couple made for each other. The Gemini woman Aquarius man are one of the best zodiac couples. I agree too…after several boyfriends Aquarius seems to be the lost piece of puzzle in my life. We understand each other so well. I’m an Aquarius male and recently got back with a Gemini woman who I’ve known since highschool , And let me tell you, she was very nice to me back then , but now we’ve gotten a lot closer, I mean communication is good, affection, sexual energy is off the charts..I love this woman, she was my long time friend and now my lover… it’s something serious because every day we talk , we share ideas and suggestions. And for me she’s someone who feels the same as I do..It’s great a match made in heaven…. The WORST relationship I ever was in was with an Aquarius so this couldn’t be futher from the truth for me. Wow! This is so true!! I’ve 21 years of a beautiful marriage, people say we act like newlyweds!! But those soul searching should know this reading is so true about both signs being flighty (I mean it’s still amazing all along the way ‘ the sexual compatibility can’t be found nowhere else! It is what kept us pushed together until our minds & souls finally matured & meshed) but just wait!! Wait for it… once the focus turns solely towards each other & the marriage gets past that (around 15 years , then it’s smooth sailing!! ) now going into our 21st year, of marriage we fall deeper into each other every single day! And can’t get enough of one another!!!! And we’ve been this way for 8 years & it just keeps growing bigger & better! I don’t do horoscopes & junk but ran across this, read it, & it is the most accurate thing I’ve ever read! I am a Gemini and my fiancée is an Aquarius and I definitely agree. He’s the love of my life and I wouldn’t have it any other way.